To make pesto, pulse all ingredients in a food processor until combined. It should be a rough texture. Add olive oil until it gets to the consistency you desire. It's best to make this an hour before so the flavors can blend while you work on the bites. Lay out prosciutto strips on a clean surface. Cut chicken breasts in half lengthwise. Lay fresh sage leaves on the chicken breast strips in a line. Press down on them so they stick to the chicken. Sprinkle the prosciutto strips with a tiny amount of all-purpose flour. Set the breast at one end of a prosciutto strip and roll it up tightly in the prosciutto. Try to roll the chicken at a slight angle so the entire breast gets wrapped in the prosciutto. Repeat with all the breasts and prosciutto strips. Heat a few tablespoons of olive oil in a large pan or skillet over medium heat. Add the as many strips as will fit without cramming the pan. Be sure to add the strips seam-side down. Cook strips over medium heat until they are cooked through and very crispy on the outside, about 15-20 minutes. Turn them every few minutes so they cook evenly. Be gentle with them and try to avoid tearing the prosciutto. Remove strips and let rest for a few minutes. Then slice each piece into 4-5 bites with a sharp carving knife. Serve bites over pesto either as an appetizer or a meal. 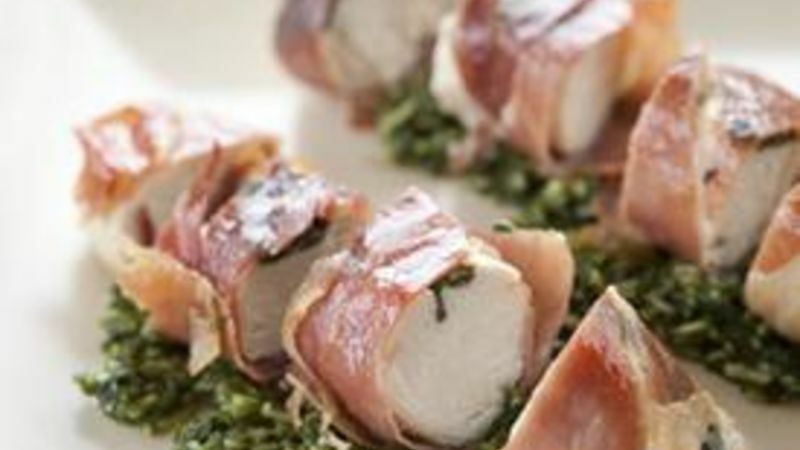 When it comes to classy dishes, in my mind it’s pretty hard to beat chicken saltimbocca. Not only does it look elegant and beautiful, it also delivers in the taste category. Normally, I just layer prosciutto on chicken breasts, sear them, and serve them whole, but I thought it would be fun to make wraps out of the same materials. And chicken saltimbocca bites were born! These little bites are rich so I thought it would help to serve them with something with lots of herb flavors and acid to cut through the richness of the chicken. Pesto seemed to be a good choice. I just pulsed all my pesto ingredients in a food processor until they were roughly combined. I love adding a bit of lemon zest to my pesto which gives it a great light flavor. Make the pesto before you start the chicken so it can sit and the flavors can meld a bit. Now let’s start these bites. There actually aren’t too many ingredients, but the execution for these can be a bit tricky. Cut your chicken breasts in half and then lay some fresh sage leaves right on top of the chicken strips. Then lay out your prosciutto strips and dust them lightly with all-purpose flour. The flour will help the prosciutto and chicken stick together. Working with one chicken strip at a time, set it at the end of a piece of prosciutto and roll it up tightly. I recommend rolling it at a slight angle so the prosciutto covers the entire chicken strip. Roll all of the wraps and prepare to cook them. Cook these guys in a pan or skillet over medium heat with a good drizzle of olive oil. I used about 1/4 cup of oil to make sure they didn’t stick to the pan.You don’t want to cook these too hot or the prosciutto will burn before the chicken is cooked through. Just a nice medium heat will do the trick.Cook them first with the seam-side down in the pan so it can get a good sear and the wraps won’t pop open later.These will need to cook for 15-20 minutes to make sure the chicken is cooked through. Turn them every few minutes to make sure they are cooking evenly. Once the chicken is done and the prosciutto is nice and crispy, take them out of the pan and let them rest and cool for about five minutes. Then slice each piece into 4-5 bites. You’ll want a nice sharp knife to do this. Then serve the bites with the pesto! I ate these bites as a meal with a small salad and some rice, but it would be a fantastic appetizer. Just provide some toothpicks so your guests can grab a bite and dip it in pesto. Nick thinks that saltimbocca is a good preparation for almost anything. Be sure to check out his blog, Macheesmo, and follow him on his Tablespoon Profile.